These wonderful, affordable hangers are a perfect way to display your quilt blocks, small wall hangings and our Mug Rugs!! They hang on a wall and are small enough to fit anywhere while strong enough to hold a nice size wall hanging. 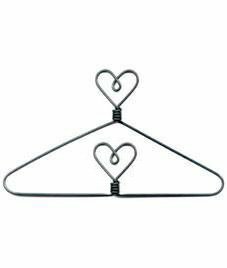 This Heart hanger has been discontinued and I bought up a bunch so everyone can afford to buy one and give it with their mug rug/block/small wall hanging. This hanger comes with clips for easily attaching anything without having to make a hanging sleeve.